Crisis Chronicles Press is thrilled to announce the publication of Kari Gunter-Seymour's highly anticipated new poetry book, Serving, on 26 March 2018. —Review in Pudding Magazine: The Journal of Applied Poetry by Editor/Publisher, Connie Willett Everett. "The poems in Kari Gunter-Seymour's Serving are so tender, reading them hurts, but it's a sweet ache, the kind worth enduring. The collection begins with the speaker's memory of her son as a young boy, in 'Oshkosh bibs and tiny / red tennis shoes,' but in the next poem, he is a young adult, deploying with his 'tactical gear' and 'newly shaved head. Why isn't this juxtaposition jarring? Because that fierce, abiding love is a kind of umbilicus between a mother and her child, regardless of age or distance. The poems in Serving are so much about place, about home, whether Appalachia or Kandahar. As Gunter-Seymour shows us, poem after masterful poem, serving is not only about sacrifice, what those in the military do for our country. Serving is also what we do for one another, for the people we call home, no matter where they are." —Maggie Smith, Author of Good Bones (Tupelo Press). "Kari Gunter-Seymour's Serving is a heartbreaking and honest portrayal of the life of a war veteran's mother. Gunter-Seymour juxtaposes the horrors of combat with perfectly rendered images of childhood, domesticity, and home, allowing the reader to experience a perspective we don't often hear about. This collection is eye-opening, unapologetic, unforgettable, and absolutely necessary." 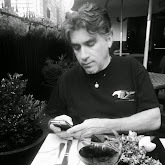 —Logen Cure, Juror, 2016 Yellow Chair Review Chapbook Contest and author of Letters to Petrarch (Unicorn Press). Serving was the 2016 Yellow Chair Review Chapbook Contest runner up and nominated in 2018 for an Ohioana Book Award. It is perfect bound, 6x9", and features 17 poems on 26 pages. Cover design by Kari Gunter-Seymour. ISBN: 978-1-940996-48-6. Available for $7 from Crisis Chronicles Press, 3431 George Avenue, Parma, Ohio 44134. 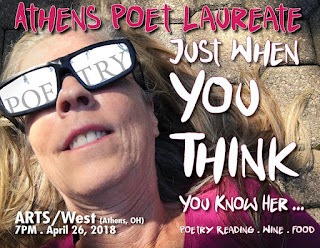 Join us for Just When You Think You Know Her..., Kari's official Poet Laureate reading (and hometown debut of Serving) on 4/26/2018, 7 p.m., at ARTS/West, 132 W. State Street, Athens, Ohio 45701. Three times a Pushcart Prize nominee, Kari Gunter-Seymour blames her method of writing on the rich Appalachian Ohio soil, her wildly eclectic family, her neighbors and the wars in Iraq and Afghanistan. She holds a B.F.A. in graphic design and an M.A. in commercial photography and is an instructor in the School of Journalism at Ohio University. She is the Poet Laureate for Athens, Ohio. Her poems can be found in numerous literary journals, Rattle, Crab Orchard Review, The American Journal of Poetry, The Los Angeles Times and on her website at www.karigunterseymourpoet.com. Kari is the founder/curator of the Women of Appalachia Project, an arts organization she created to address discrimination directed at women from the Appalachian region.